With the busy period of Easter safely out of the way, I was looking forward to being more spontaneous during my period in the Copper Canyon. I figured five days would give me enough time to see the canyon, and get to do a fair bit of hiking done. Turns out that was a mistake – a bit more forward planning on this occasion would have been quite handy. 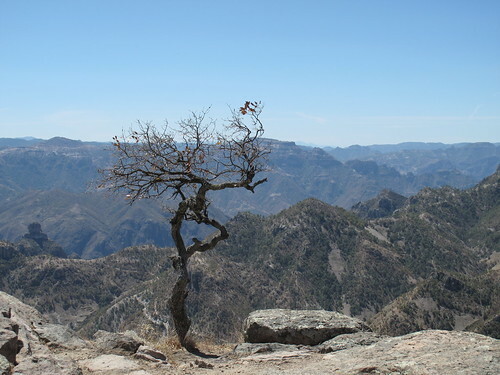 The Copper Canyon (or Barrancas del Cobre in Spanish) is a huge system of five interlinked canyons, which at nearly two kilometres from top to bottom is actually deeper than the much more famous Grand Canyon. 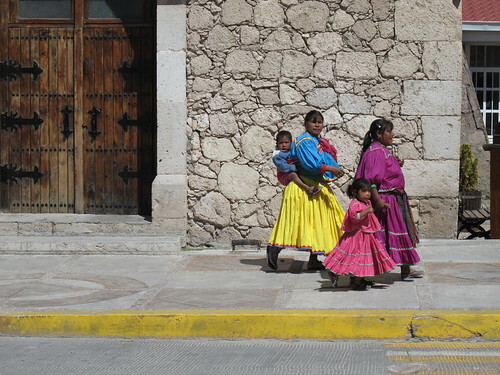 Before arriving in Mexico, it was the thing I was most looking forward to, so I was surprised when some of the other travellers I’d met further south said it was a bit disappointing (most memorably dismissed by one as ‘just rocks and stuff’). After staying in Creel, I can see why. Creel is the biggest town in the Canyon area, and has the most hostels and tour companies, so that’s where most people choose to stay. The problem is, Creel is neither inside the canyon, or even on its rim: you have to drive quite a way to get to either. The things to around the town are nice, they’re just not really in the canyon. On my first day there I hired a bike and cycled a 20k circuit around the surrounding area, through the village of San Ignacio (with its Spanish mission) and on to some interesting rock formations nearby, each named by what the rocks supposedly look like. First up was the Valley of the Frogs. Didn’t look anything like frogs to me. Next, the Valley of the mushrooms (much more accurate). 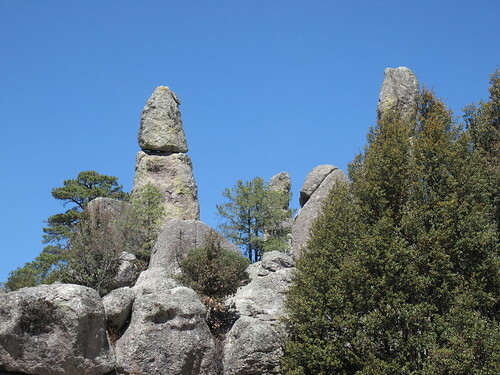 Last, and most impressive, is Bisabirachi, which in the language of the local Tarahumara Indians means “Valley of the Erect Penises”. The rather more prudish Spanish renamed it Valle de los Monjes, or Valley of the Monks. 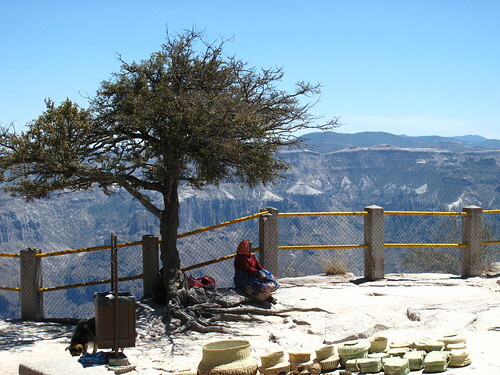 I think it’s safe to say the Tarahumara have a more accurate view. Missions and rock formations are very beautiful, but at the end of the day I was left pretty disappointed: I’d come to see the canyon, and this certainly wasn’t it. Chatting to other people at the hostel that evening revealed more disappointment, as other people had been to the nearby waterfalls, which turned out to be (a) not all that impressive and (b) nearly dry as well. So the next day I decided that I needed to see the Canyon properly, and jumped on a bus to Divisadero. 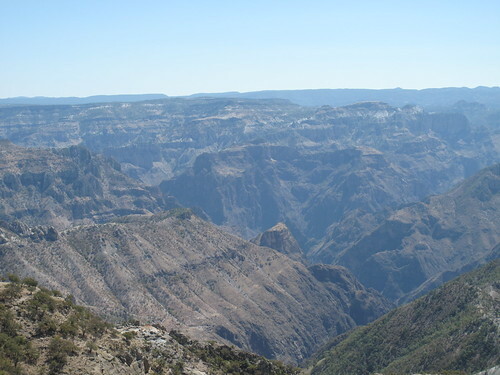 Divisadero sits right on the Canyon rim, directly opposite the point where the three biggest canyons converge, and therefore has the best views in the region. As soon as I got off the bus, all the previous day’s dissapointment fell away. The view is truly spectacular, words fail me when I try to describe quite how beautiful it is. The canyon rim falls right away beneath you in a sheer cliff, looking right out into the deepest point of the canyon system, and in parts there isn’t even a safety rail to block the views. I stayed for a few hours, looking down at the view from various points on the rim, and it truly is one of the most breathtaking views I’ve ever seen. What I didn’t realise at that point, was that the next day was going to be even better. 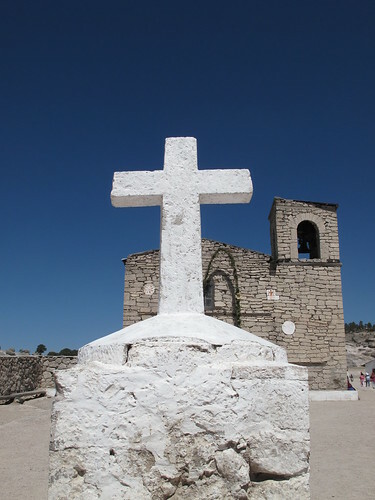 This entry was posted in Mexico, Outdoor activities and tagged Barranca Del Cobre, barrancas del cobre, canyon, chepe, Chihuahua, Copper Canyon, copper canyon railway, Creel, divisadero, escapism, Mexico, Northwest Mexico, raramuri, tarahumara, travel. Bookmark the permalink. Geoff, what great photos. So glad you’re discovering wonderful places. Their traditional dress looks like Rajasthani women’s traditional dress. And the sky looks great in other photos. Looks fantastic. Hope the onset of world wide flu scares etc… hasn’t taken the gloss of matters. Peter Sayer will be launching his pandemic flu plan soon! By all accounts it’s pretty weird in Mexico City. Here in Guadalajara I’ve seen a few people with masks on, but otherwise life is currently carrying on as normal. Although I’m sure it’s bound to hit here soon, not too worried at the moment but travel plans may have to change slightly. Peter must be quite annoyed at the extra work that’ll create for him! Phew! You’re ok – I did wonder where in Mexico you were. 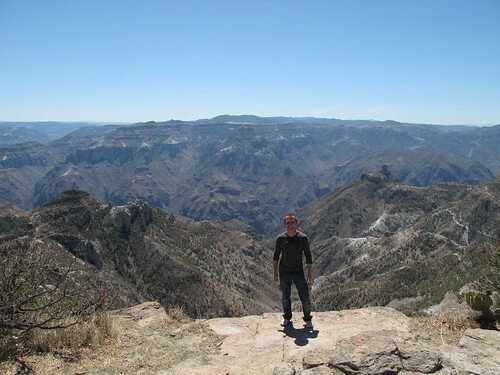 I loved the canyon too… one of my most memorable trips in Mexico… glad you are seeing so many great things here! !